The ephemeral video and post contenting is hot in trend - it tempts the social media user base as the contents last for short duration. After Snapchat, Instagram also rolled out with a similar feature. Instagram stories have already accrued more than 250 million daily users, whereas Snapchat hols 173 million daily active users. How Instagram Stories can help nonprofit! In Instagram non-profit can build an audience base using features such as popular hashtags, prescribed accounts, tagging option based on location, and ‘Search’ & ‘Explore’ options. The Stories are less polished than Instagram posts, which creates an authentic and personable voice to interact with followers. Showcase People as these days the trend follow connecting with people on social media more frequently than brands and logos. Further, there's a sign-up option for the Instagram Business account. It’s free and provides useful tools that are not available with the personal account, including analytics and a Contact button. Now, create a strategy around your story and invest time and thought. For instance: One of the non-profit "CARE" used Instagram stories to tell compelling stories of seven women. The campaign was titled “Stories from the Other Side of the World,” following seven women over seven days, their streams littered with the tropes of Storie's narrative. The power of video is robust. Approx 500 million people watch facebook videos every day. 82% of Twitter users consistently watch video content on the platform. And if we talk about twitter video, 82% of users consistently watch the video, whereas Snapchat generates 10 billion video views every day. Video has become a popular trend, which is hard to ignore and apparently grow in 2018. Further video streaming generates more response by the immediacy and engagement it creates - supports real-time respond. Make live streaming an integral part of your marketing strategy, and also schedule the time and setting staying consistent for immediate results. This provides benefit to maximize your scope and create new leads for your company. The social media Nonprofit Application Development trend is further expected to leap in the next few years with the 5G standard. From past couple of years - influencer marketing is grabbing the trend. The effectiveness of influencer marketing is great as long as it poured positive effects on the users. However, the Millennials are less trusting of influencer these days, since distinguishing the line between genuine and blurry has become difficult. But the results and constant evolving of the influencer marketing is on high. Usually, the engagement rate is better with micro influencers. Make sure to choose influencers who seems active and speaks often related to your nonprofit’s mission. For instance, if you run an animal shelter, here, preventing animal cruelty should be active part your brand’s mission statement. Connecting your mobile application with social media influencer can also produce positive results. Globally, 18.7 billion texts are sent worldwide on daily basis. And 60 billion messages are sent every day through apps like WhatsApp and Facebook Messenger. This is clear from the context that Facebook Messenger itself has over 1 billion monthly active users. By 2018 messaging apps are expected to increase the number of social media users worldwide to 1.1 billion users. As we know, the potential donors prefer communication via messaging irrespective of emails and calls. Thus, targetting the Gen Y or Gen Z becomes easy enabling them to reach the way they prefer and it can hit the audience into potential donors or volunteers. Furthermore, chatbots popularity is increasingly soaring. Generally, a ‘bot’ is any software that undergoes an automated task or is software that interacts with a human. For instance, a user could ask the bot a question or give it an instruction and the bot could respond or perform an action as defined. A chatbot development could benefit nonprofit, especially in the case the nonprofit is large and receives hundreds or thousands of similar questions. For example, when you receive a lot of questions about the donation system. For example, Sprout one of the leading non-profit organization, give product guidance and take actual orders on Facebook Messenger. It is further calculated that there have been 3.5 times. increase in organizational productivity with bots. 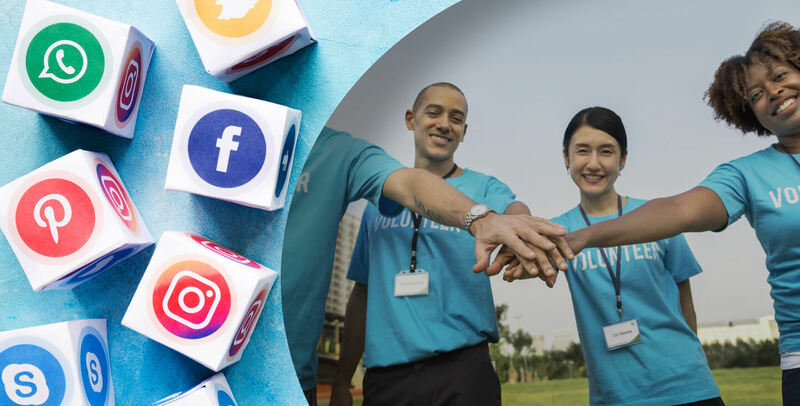 As we know, how technology is evolving at a surprising note, and savvy nonprofit professionals understand the immediate need to attract their potential supports in the digital age - followers immersed in social media. Use social media application strategy but try something creative with it. Avoid using generic content, think of great ways you can engage potential users personally. Get started with unique non-profit application development solutions. Show your supporters you relish them and the impact they had on your beneficiaries. Hire technology first non-profit application development company like Root Info Solutions!